Hi! 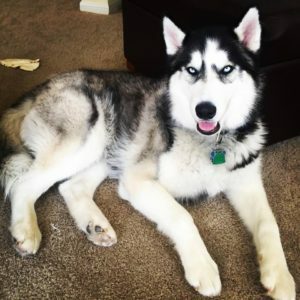 My name is Neeko and most would called me Husky although i’m pretty fit, running is my favorite. I am 3 years old now, and spent the first two years of my life living in Pittsburgh, PA until we moved to Olathe, KS. The weather was much nicer back east in that it was usually colder and had a lot more of the white stuff that falls from the sky. Running in the white stuff was the best! I live with 2 cats who i love to play with all day but for some reason they wont play with me. I love my humans who give me the good life and lots of treats! Besides running, some of my favorite things to do are hiking, which is kind of like a slow run, fast walk. Dog parks, but it’s ones with woods or bust cause you never know what your going to find in there. Chasing squirrels, rabbits, moles, toads, birds or pretty much anything that comes in my backyard. Peanut butter! Of course, how could i forget the single best thing this planet has to offer. I also find it educational to have conversations with my humans, although they never seem to get me. But they take on these rides where if you stick your head out of a hole on the side wind hits you in the face! Ahhhh, one of the best feelings in the world. Plus other people seem to like me cause every once in awhile i’ll catch the paparazzi snagging some pics and waving cause i look so good after leaving Four Paws! I think i have a new arrival coming soon, my humans have put all kinds of cool toys and new stuffed things that I could easily chew on in the bedroom and I hear them mention I will have a new sister on the way. I hope she plays more than my cat friends, her toys already look so fun! My humans always shut the door to this room when they leave me but one day my mom forgot and I decided to explore. I went straight to the stuff on top of the dresser and shredded these wet cloths that smelled like baby powder. I then grabbed two tubes of white stuff and thought they were tasty at first but then when it came back up i wasn’t feeling so good. My mom came home and she wasn’t happy, I heard her on the phone with my vet asking about Diaper Cream and if it is toxic to me, fortunately i didn’t have to go see my vet but I think that is the last time I will eat anything out of this room. I love to get groomed at Four Paws! The staff there is so friendly and always makes me feel like the softest husky in the world. They also cool me down a bit in the heat of summer, for which i am extremely grateful! Anything helps in that regard. I know i’m not the easiest pup to deal with but thanks for putting up with me! Can’t wait to see you again!